Today is the third and final of my three Danish posts. Now is the time to pull out the piping bags and pastry brushes, as we come to my favorite part: shaping the dough. Now there are probably as many ways to shape Danish as there are to make barbecue sauce, and I intend to (someday) try them all. However, at my pastry school, we were only taught fourteen—which is still a nice selection to choose from. For these Danish, I used one of the slightly more unique shapes: the mini vol-au-vent. I call it a diamond twist. For vol-au-vents, as far as I ever learned, are those tall, round pastry cases that the French use as edible serving vessels, and bear no resemblance to this particular shape at all. However, if you would prefer to call it a mini vol-au-vent, because a pastry with a French name always sounds more impressive, you would be entirely justified. Perhaps we should compromise on diamond vol-au-vent. Whatever you call it, the shape looks impressive and gives you a nice, large cavity to fill with delicious concoctions (in my case, pastry cream and baked apples). If you don’t know how it is done though, the shape looks quite mysterious. Here’s how you do it. 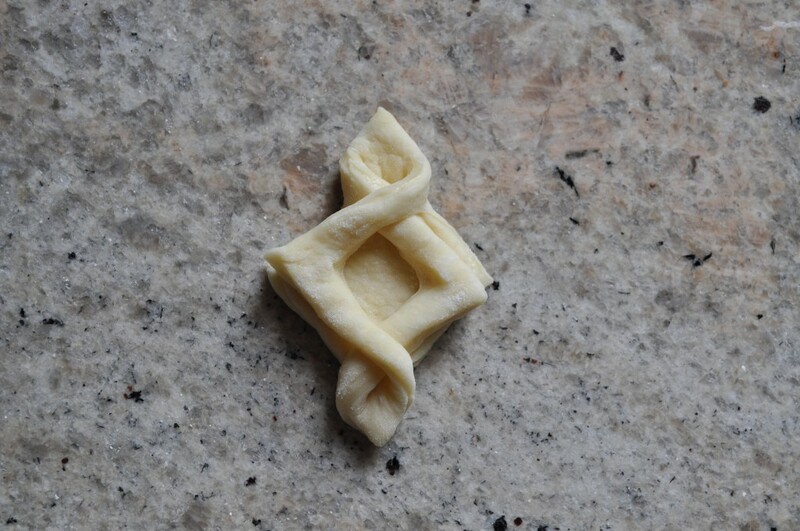 You start with a square piece of dough and fold it in half to form a triangle. Then you use a sharp knife to make two slits, each one parallel to one of the triangle’s short sides. The slits should be about ¼ of an inch from the edges of the dough and reach almost all the way to the triangle’s top point. Unfold the square. You will see that there is now another square inside the first one, attached at only two of the corners. Turn the dough so that one of the intact corners is facing you. I strongly encourage you to use a pastry bag to pipe the pastry cream into the center cavities (if you need instructions on how to fill a pastry bag, see my post on piped sablé cookies), simply because it’s so much quicker and neater than using a spoon. In a pinch though, a spoon would work just fine. After you’ve filled all the Danish with the pastry cream, press a spoonful of baked apple chunks into the top of the cream, and then pop the tray of Danish into the oven. Danish are usually egg washed before they are baked, but I often skip this step. Although the egg wash gives the Danish a nice dark golden sheen, if you’re going to be glazing the Danish after they come out of the oven anyway, it’s pretty much just a waste of time. Ah, yes, the glaze. I won’t say it’s the best part, but a Danish without glaze seems incomplete to me. Since my Danish featured apples, I decided to combine apple juice with enough confectioners’ sugar to make a thick glaze, and then seasoned it with plenty of cinnamon. I made it up on the spur of the moment, and was very happy with the results. And you will be, too, if you decide to try your hand at these. The crisp, flaky dough, with creamy vanilla-scented custard, tender apples, and a sweet spicy glaze . . . mmm. Note: I never measure ingredients for a Danish glaze. I just fill a bowl partway up with confectioners’ sugar and then add enough liquid to get it to a spreading consistency (in this case I was using apple juice, but you can also use milk, lemon juice, etc.). After each tray of Danish comes out of the oven (I usually make four), I glaze them; and if I need more glaze for the next tray, I just add some more sugar to the leftover glaze and adjust the consistency again with additional liquid. And of course, I adjust the seasoning (which was cinnamon this time) whenever I add more sugar and liquid. Take the Danish dough out of the refrigerator and cut it in half. Put one half of the dough back in the refrigerator. 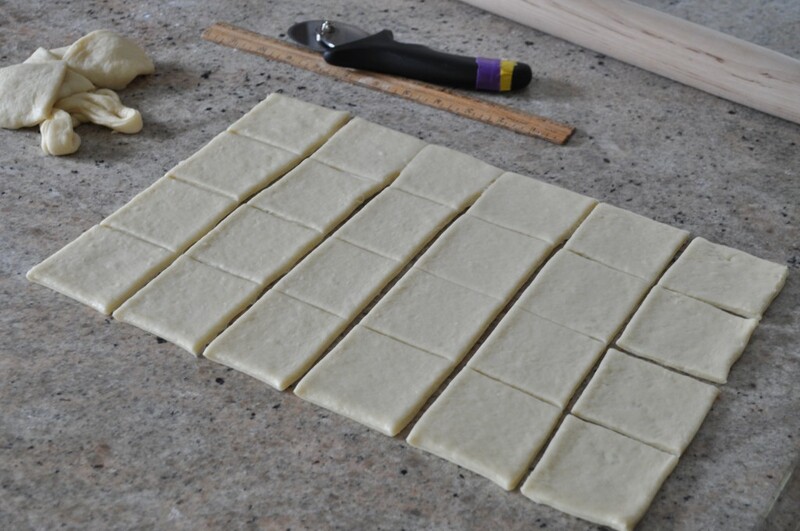 On a lightly floured surface, roll out the dough to slightly larger than a 10-x-15-inch rectangle. Transfer the sheet of dough onto a parchment-lined baking sheet and chill it in the refrigerator for 20 minutes. Bring the chilled dough back out onto the counter. Use a sharp knife or a pastry cutter to trim the rectangle so that its edges are straight and even, and it measures exactly 10-x-15 inches. 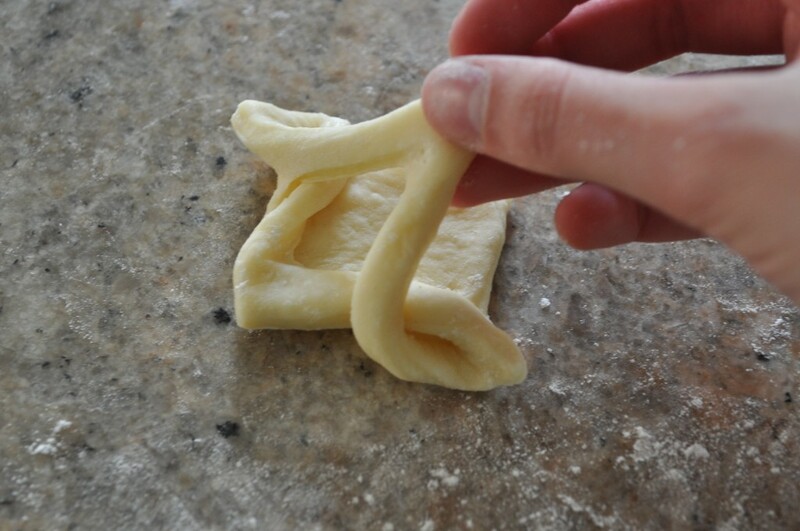 Cut the dough into twenty-four 2 ½” squares, four down and six across. Place half of the squares back in the refrigerator. Fold a square into a triangle. 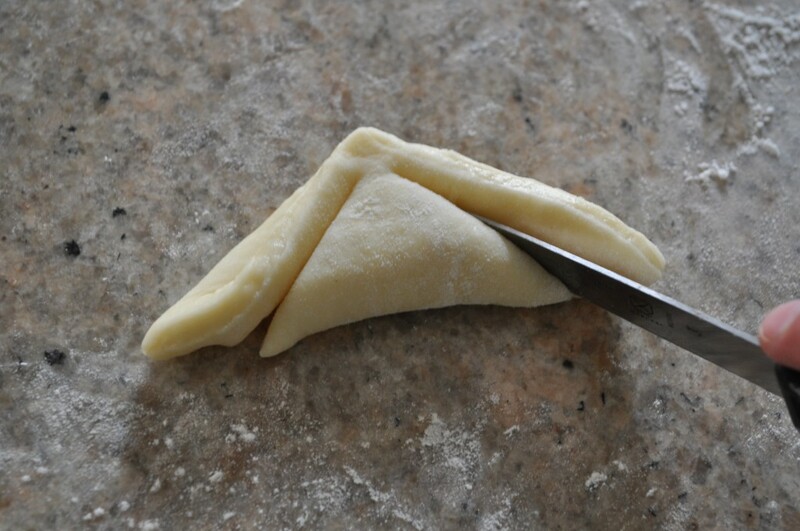 Use a sharp knife to make two slits in the dough, each one parallel to one of the triangle’s short sides, about ¼ of an inch from the edge of the dough and reaching almost to the triangle’s top point. Now there should be another square inside the first one, attached at only two of the corners. Turn the dough so that one of the intact corners is facing you. Lift up one of the unattached corners of the outer square, and fold it over to line up with the opposite corner of the inner square. Repeat with the other unattached corner. Place the shaped Danish on a parchment-lined baking sheet. Preheat the oven to 375ºF (190°C). Allow the shaped Danish to rise until they are doubled in size and an impression made in the dough does not spring back. While these Danish are rising, take the other squares out of the refrigerator and start shaping them and then set them aside to rise as well. Use floured fingers to press down the puffed dough inside the center cavities of the risen Danish. 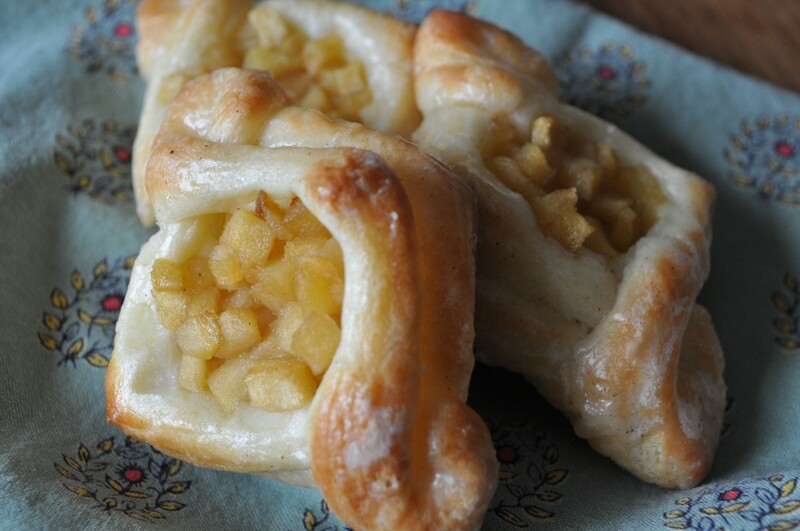 Fill a pastry bag fitted with a round tip with pastry cream and pipe a generous amount into the center of each Danish. Press a spoonful of baked apple chunks into the top of the cream. Bake the Danish for 14 to 15 minutes, or until the edges are caramel brown, rotating after 10 minutes. 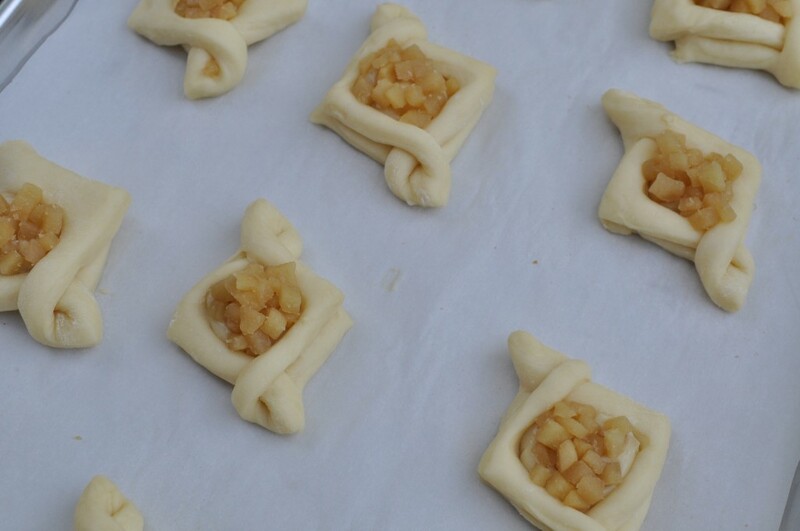 Transfer the baked Danish to an icing grid or cooling rack placed over a sheet of parchment paper. Use a pastry brush to spread the glaze over the Danish. Once the second tray of Danish has risen, fill them with pastry cream and apples, and then bake and glaze them as well. Repeat this entire process with the second half of the Danish dough. 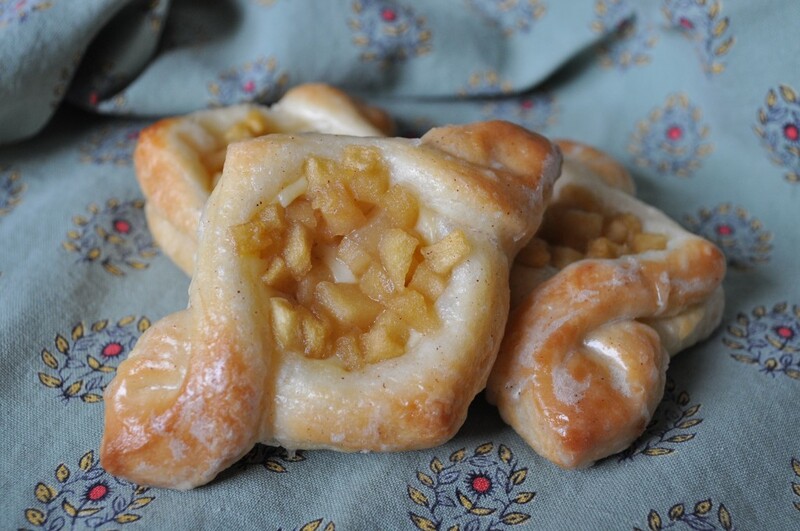 Serve the Danish on the same day as baking, or freeze them, unglazed, for 3 to 4 weeks. Frozen Danish should be re-heated in a low oven (300°F/150°C) until they are warmed through, and then glazed. Final Note: Don’t throw out the trimmings from the Danish dough. Stack the scraps back together (don’t ball them up: the layers in the dough would be destroyed), and re-roll them into a rectangle an ⅛-inch thick. Spread a thin layer of some kind of filling over the dough (jam, fruit lekvar, cinnamon sugar, frangipane, etc.) and roll up the rectangle into a tight cylinder, starting from one of the long ends. Chill the cylinder of dough until it is firm enough to slice and then use a sharp knife to cut it into ½-inch thick rounds. Place the rounds on a parchment-lined baking sheet and allow them to rise until doubled. Bake at the same temperature as the diamond twist Danish. The baking time will depend on how large your cylinder was—which depends on how many trimmings you had. Just look for those caramel brown edges. Glaze if desired.